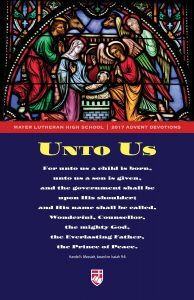 Advent greetings to you in the name of our Lord and Savior Jesus Christ from your family at Mayer Lutheran High School! These Advent devotions, written by the students at MLHS, are our gift to you. You can read them yourself, or come back to our website (or visit our Facebook page) each day to watch a video of the student authors reading their devotion for that day. As we prepare the next generation of Christian leaders, we relish the opportunity to demonstrate the love of Christ in word and deed. The season of Advent offers a perfect time to refect on the saving work of Jesus and to look ahead to the day when we will be with Him and all the saints in heaven, where the celebration will never end. It is that sure hope that makes our ministry to young people so essential and special. For fifty-seven years, our faithful teachers have prepared Christian leaders to serve the Lord in a remarkable variety of vocations. By the grace of God, Mayer Lutheran High School pursues its mission with a zeal that can only be explained by the power of the Lord working among and through His people. We are grateful for the blessing of providing a Christ-centered high school education for the kids in our region and around the globe. By using mere people empowered by the Holy Spirit, the Lord has directed our movement to provide leaders for His kingdom, many of whom are reading this message. Thank you, everyone, for your prayerful support and encouragement for the vibrant asset in God’s Church that is Mayer Lutheran High School! We pray that you will grow closer to the Lord as you read these devotions and that the Holy Spirit prepares your hearts for the coming of Jesus. May you and your family always be faithful and may we all, together, continue to prepare the next generation of Christian leaders with joy, energy, courage, and generosity of time, talents, and treasure. God’s richest blessings to you this Advent season, Christmas, and throughout the New Year!